One thing that Central Texas gardeners can count on during September into October is the termination of the long hot of summer with a very welcomed re-introduction of our second spring. Compensating for our brutal summers is the reliable flush of new growth, open, exuberant blooming, and gifts of rain–sometimes too much–to gardens and the critters who rely on those gardens. Typically, we enjoy our first cool fronts at this time, and while the cool is fleeting, it certainly takes the hot edge off of our days and nights. You’d think wildlife would be appreciative of any small portion of relief, but this past month hasn’t necessarily been packed with wildlife happenings, at least that’s so in my garden. Nevertheless, here are some offerings for Wildlife Wednesday. Blooming perennials, reawakened with softening temperatures and gulps of water from the sky, have given pollinators of all stripes, scales, and feathers plenty in their search for pollen and nectar. This honeybee worked the flowerets of Garlic chives, Allium tuberosum. The same bee worked the neighboring bloom of Rock rose, Pavonia lasiopetala. 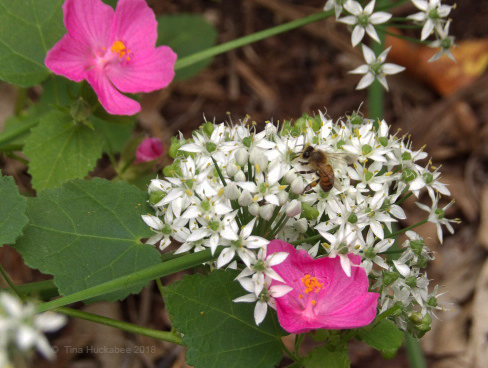 As well, tiny native bees also partake of both kinds of blooms. Typically, September sees the beginning of autumn migration from northern parts of North America to Mexico, Central America, and South America. 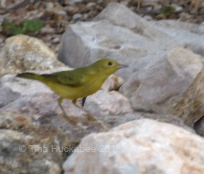 Early in September, a pair of Yellow warblers, Setophaga petechia, spent several days visiting my pond. I couldn’t get a shot of them together, or a lone shot of the female, but the male sat still long enough for a couple of quick shots. 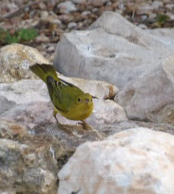 Each warbler hopped around the limestone rock which borders the pond, with nervous flutters into the oak trees. I never actually saw any bathing in the bog, or splashing the the waterfall, but both birds were clearly interested in the water feature. I see this species each spring as they head northward, but don’t recall ever witnessing an autumn visit before. That said, I haven’t observed any other migratory birds through my garden this past month, which is odd. The autumn migration season spreads out over a longer period and isn’t as intense as the spring migration, but I’m surprised that I haven’t seen other passers-through at my pond or in the garden. I hope the migrants are finding enough in rural areas to forgo urban gardens. 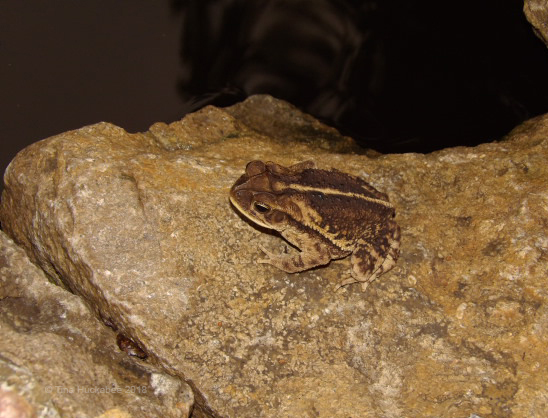 My pond toads, Gulf coast toad, Bufo valliceps, are croaking their way to the end of their breeding season. I’ve seen itty bitty, baby toads in the garden, but this grown fella was willing to pose for me at sunup one morning. 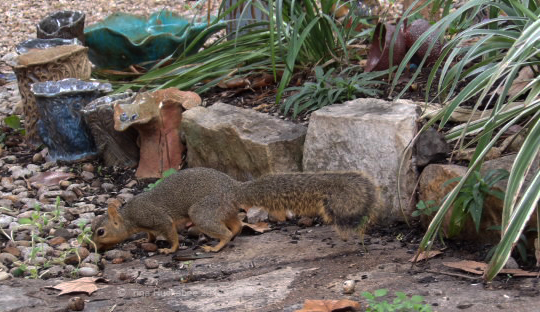 The neighborhood squirrels are up to their usual antics, like the actions of this female Eastern Fox squirrel, Sciurus niger, who was bound and determined to have the birds’ seeds for lunch. Success! Who knew that noshing on the ground is easier? 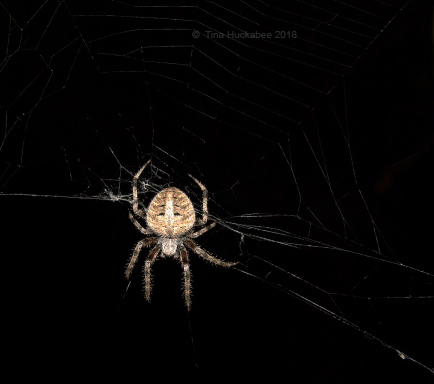 Finally, in a nod to the end-of-October scare, is this gorgeous spider who’s been hanging out at my back patio. I’ve identified her as a Spotted orbweaver, Neoscona crucifera. I don’t find her scary and in fact, I think she’s quite beautiful. She’s also large; her abdomen is about an inch in diameter–a big girl! I’ve only seen her at night and she’s shy, so she scuttles up her web into the ceiling of the patio cover when she notices me. I was fortunate to catch this shot of her. I wonder if she was drowsy with digestion? What’s winging or singing in your garden during this predictable season of change? Please post about your wildlife happenings and remember to leave a link when you comment here. Happy wildlife gardening! This entry was posted in Uncategorized, Wildlife Gardening, Wildlife Gardening in Ausin, Wildlife Habitat, Wildlife Wednesday and tagged Eastern fox squirrel, Neoscona crucifera, Sciurus niger, Setophaga petechia, Spotted orbweaver, Yellow warbler by Tina. Bookmark the permalink. You have a nice variety of wildlife. I call this spider season. I can hardy walk through the yard without encountering a web. Always something interesting in your posts… We have a lot of spiders in our garden too. Not as big as yours, but just as beautiful. I always feel terrible when I crash through their carefully woven creations. I’m very fond of spiders. Don’t want to eat breakfast with them, but love havning them around and I agree, they’re lovely. I don’t like being a home wreker either. I loved this visit in your garden. Thanks. Tina your photos are magnificent. The bee eating from the flowers of Allium tuberosum surrounded by flowers of the rose rock is adorable. The yellow warbler is beautiful. The bufo valliceps I like very much. The Chipmunks are very nice, I adore them, although they do a lot of pranks and some big ones. Spiders are not my favorite but I respect them because they are part of the ecosystem. The Neoscona crucifera is very beautiful. Thank you very much Tina for showing us the visitors of your garden. Have a very good week and weekend. Greetings from Margarita. Thank you, Margarita! I suspect your chipmunks are just as silly as our squirrels are–they’re always good for a laugh! You have a good week too! That’s a very sweet bird. 🙂 I wonder if the bee gets comments from other insects on its garlic-smelling feet? Our weather in the UK is a bit weird at the moment and there are still loads of flowers, bees, butterflies and also some day-flying moths. The butterflies were having a feeding-frenzy a few weeks ago on the Marjoram flowers, and now they’ve switched over to the beauty bush. Yellow warblers are very yellow–like darts of sunshine in the garden. Haha, I wonder about garlic-infused honey, it’d be good, wouldn’t it? I hope your weather settles into a normal pattern, though who knows what that is anymore. It’s interesting when pollinators (or birds with seeds), move from blooming (seed-setting) cycle of one plant to another. We’re enjoying our “second spring” in DFW too. With it can a tremendous amount of pollinators…or maybe the new flowers in my garden just attracted them. We’ve worked at attracting butterflies and bees, but maybe it’s time to work on attracting the birds too. Squirrel antics are hilarious as long as they aren’t chewing through something valuable. Your yellow warbler is pretty. The rain here has seemed to keep the migrating birds away or at least I don’t see as many since I stay inside more. 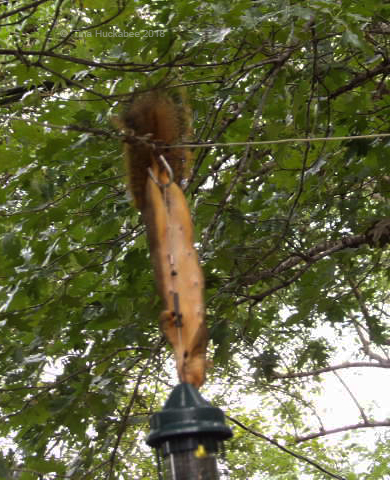 Haha—yes, squirrels can certainly do lots of damage, but I generally have a good relationship with them–so far! We’ve had rain, but maybe not as much as you? I wonder if it’s the rain that has limited the migratory birds from coming to Austin. Hmm. 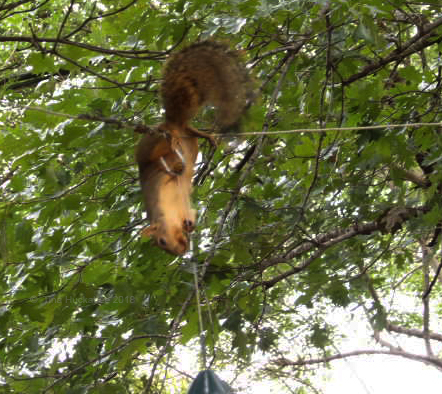 I liked seeing the squirrel antics. We don’t have them here, so they are a novelty. We have a number of birds visiting the garden, the cutest being the little wrens, and bees are out in full force, especially on my Ceonothus where their saddlebags are visibly full to bursting. There’s a worrying lack of butterflies. I’ve known other Australians who just love squirrels. That’s fine, I’m rather fond of them myself. I’ll bet your bees love the Ceonothus, I do too, though it doesn’t grow here. I hope you see more butterflies; I’m seeing more now than during summer. GADS! They’re SQUIRRELS! They are EVIL! They steal fruits and nuts, and just as someone is about to shoot one, the targeted squirrel unleashes powerful mind control that convinces everyone within range that squirrels are cute! I love your toads. I hope that we end up with lots of croaking frogs in our pond too.Yellow warblers are beautiful birds and yes, just like sunshine. It’s lovely to see migrating species using our garden facilities to top up and refresh themselves. Makes it all worthwhile. I love my toads too, but they can be loud, loud, loud. They’ve gone very quiet this past week: could be the shorter days, or, that screech owl I heard trilling in a neighbor’s tree a couple of mornings ago. I agree with you about providing for the wild things and I’m so glad my garden is a welcoming respite for them. She was fun to watch. The photos are meh, but probably because I was giggling. Nice shots of the Yellow Warbler. 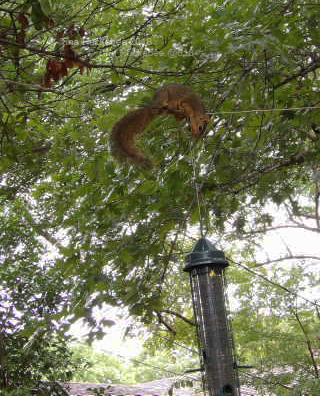 I’ve managed to keep the squirrels away from the birdfeeders. Now if only I could control the rabbits. I don’t have rabbits, but I know they’re annoying in some neighborhoods around Austin. The past two days, the monarchs have been streaming through, and the word is that farther south the rains have somehow encouraged other species to emerge or flock or whatever — especially the snouts. With so much rain in September, every nice day had to be devoted to work, so I’ve hardly been out and about, but I have noticed that lantana, frostweed, and goldenrod are beginning to really do their thing. I’ve had to cancel or at least postpone any extended travel for October, just to get caught up at work, but that means more time to explore some areas in Texas on the weekends. Fall in Texas can be beautiful, too — maybe I’ll see a yellow warbler! Oh, I surely hope that I get some monarchs, but I haven’t seen any so far. I’d heard about the boom in snout population, though I haven’t had any numbers out of the ordinary. Sorry your work schedule has been impacted by rain; I think you must have had much more than we have, though we have been drippy recently. I think fall in Texas is wonderful! I had a hummingbird visit my lantana while I was pulling the henbit around it. The butterflies are reappearing here and there, and the skinks were out and about… Although I haven’t seen much of them since I removed the sweet potato vibe jungle from my garden. I’d like the little white moths (whose caterpillars eat my greens!) and the ants and mosquitoes to be less plentiful in all the drizzle we’ve had… Soon I suppose? I think my hummers are gone. We had that little cool front about two weeks ago and I haven’t seen any since. I always miss them! Maybe they’ll come back! My mom gets some crazy over-wintering ones in Oregon. I’m not sure how they make it through the nights but she keeps them in warm sugary water throughout the day. I’ve seen overwintering hummers before, just not every year. Right now I’m pouting because I haven’t seen any migratory birds, with the exception of the yellow warbler a month ago. Weird. Oh, your mom lives in Oregon! I wanna live in Oregon. I miss visiting–my son went to school there. Thanks, Nell. I’m a bit baffled, and your assessment might be correct. As well, sometimes they steer clear of urban areas and are prolific in rural areas. The monarchs do the same. I hope your weather pattern returns to a seasonal norm. A second spring? :)) You deserve that Tina. Yes, it’s a nice little gift after our tough summers–trust me, we all appreciate it! Oh, I bet you’ll miss them. They’ll probably bypass Central Texas and head further southward, though occasionally, one or two will over-winter here. Loved this again. Squirrels and spiders are our friends.